While the Greens vote did quite well throughout the metro area, rising in most councils, the party performed relatively poorly in Inner West Council elections. There was a huge swing against them in Balmain (-10%), with Rochelle Porteous failing to even make quota, although scraping in on preferences. The final composition of the 16 seat council will share its strength between Labor and the Greens, with just two Liberals and two Independents joining them. Several ‘independents’ (read: Labor aligned) fared decently in Canada Bay — of the two ‘independent’ candidates, one was a splinter ALP group (Neil Kenzler), who split from the ALP after a dummy-spit over pre-selections, and the other was Daniella Ramondino (elected), who is rumoured to be “close to Angelo” (says a Liberal Party source). Daniella preferenced Labor, and vice versa, but ex-ALP stalwart Neil Kenzler is out in the cold, despite an active campaign. Mayor Helen McCaffrey, who was number four on the Liberal ticket, is out too, having not made quota, and Angelo Tsirekas (Labor) will be back to snag the top spot. The Inner West Courier’s front page brought news of another “victim” being “gobbled” up by the hated WestConnex motorway last month. The victim? A car dealership, one of those dreary eyesores once regarded as synonymous with Parramatta Road’s blight. If you read a little closer, though, it turns out that the owner of Muirs Motors was actually “extremely happy” to be “gobbled”, and, according to the Roads and Maritime Services, he had approached them! Someone seems delighted to be trousering a truck-load of money (thank you very much, WestConnex Authority), and the family business will look for new Parramatta Rd premises — but perhaps “business very happy” didn’t fit the page space. A victory for free speech, as Danny Lim wins his appeal against a $500 fine for wearing a sign that called Tony Abbott a c***. The sign read: “Peace smile. People can change. Tony you can’t,” with the ‘a’ in “can’t” printed upside down. A self-described ‘peace activist’, Danny has lived in Strathfield for 40 years and has previously dipped his toe in local politics. He’ll be happy to not have to pay his fine, and get a nice media boost for his message while he’s at it. 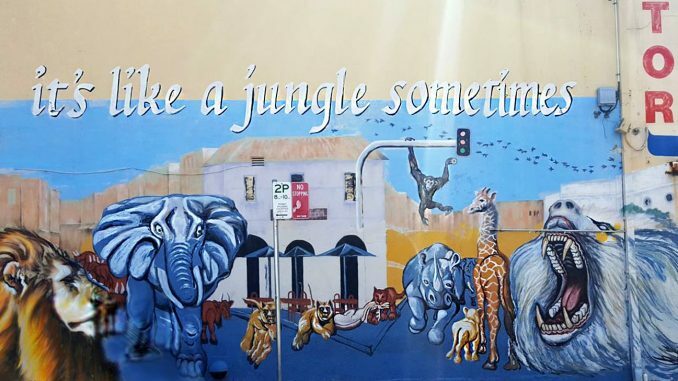 Outrage has erupted in Newtown after the locally-famous “it’s like a jungle sometimes” mural on Enmore Road was painted over by a new mural advertising the Hollywood movie ‘Mother!’. Locals were unhappy with Apparition Media, the company coordinating the artwork, for their perceived disrespect for a community treasure, and made this fact known with sustained social media backlash. Apparition has since pulled out all stops on the PR front, apologising to residents for their ignorance and vowing to work with the original artist to restore the mural. It’s been painted blue with a small Lifeline logo in the meantime. We hope some positive storytelling will emerge from the drama. The increasingly crowded Inner West light rail is to receive another 95 weekly services to the timetable to help cope with rising commuter levels. It’s hard not to feel like you’re crammed in like sardines when riding the trams in peak hour. The numbers reflect the reality, with government figures suggesting that journeys increased by 60 per cent between 2013 and 2015. Here’s hoping that the extra services provide some much needed relief for the light rail. We’re hearing that local residents are outraged by the 45 per cent price hike in the cost of Strathfield Council’s picking up household garbage bins. Residents in the Strathfield local government area are now among the highest paying ratepayers in the state for domestic waste services, where the annual standard waste service price has increased from $485 to $705. It’s ‘rubbish’, indeed.